All the tiles, fittings (hip ridge etc), valley tiles, and custom made turret tiles were individually CRAFTED BY HAND. 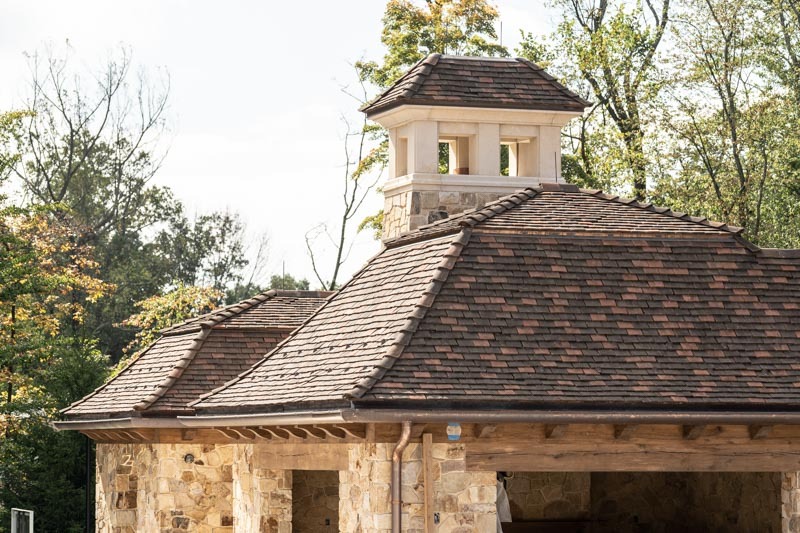 In 2000 Stuart Matthews was contacted by a small family -owned factory that made roofing tiles for the local market as well as handmade bricks, exactly in the same way the Babylonians made bricks 3000 years ago. The factory is two hours outside the port city of Izmir in Turkey. Stuart sent the factory a drawing of a wooden bench and a box for making tiles. Later that year, he went to the factory and taught one tile maker how to make English style tiles exactly the same way they did in Elizabethan, England. Today, this company is one of the only companies that offer truly handmade English tiles in the UK market. l) Sand is placed into a wooden box. The clay will stick to wood and metal so the sand is a release agent as it sticks to the face of the tile and gives the tile a sandy finish. The sand can be colored to create some of the earth tone colors. 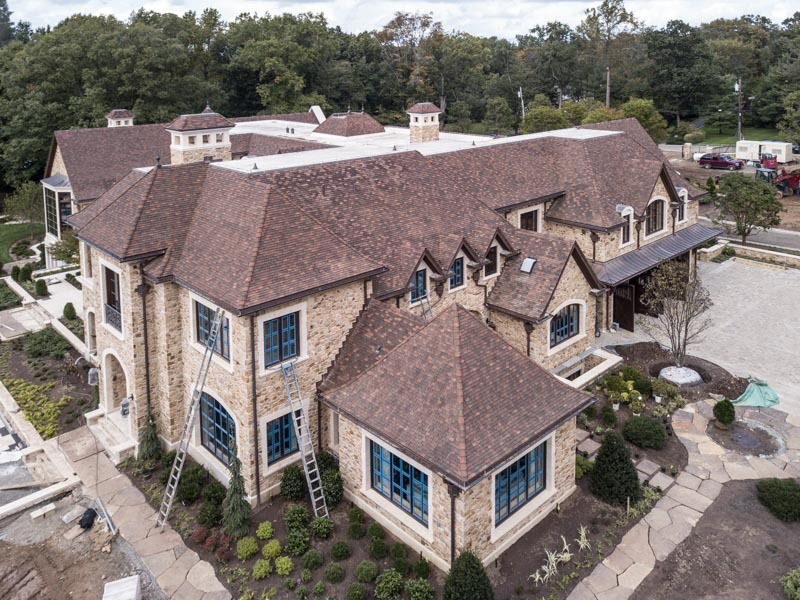 For this Bergen County, NJ project they used a blend of classic grey and brown. The tile makers start by lifting a 40 pound lump of clay above their head and throw it down into the box. The clay has to have a very high moisture content so that you can squeeze it thru your fingers. If it is too stiff, it can break the tile makers wrist. Next, they cut off the excess clay with a metal rod and scrape the back side of the tile smooth and then pull the leaver down to form the nail holes and nibs. Finally, the tile is removed from the box, the bottom edge of the tile is sanded and is placed on a rack to dry.A tile maker will hand throw between 800 and 1000 tiles each day. A feature of this roof was the use of valley tiles. This is a English detail. A tile was handcrafted to form the sweep of the valley. No metal flashing is used and as this roof featured a sweep at the eaves, we made the different angles to allow the valley to transition thru the sweep (See photo IN Progress Valley Tile). Northern Roof Tiles supplied all the tiles for the turrets and the rounded hip over the front entrance. This reduced any cutting on site. The picture dated March 1 st features two Hayden employees who helped calculate the sizing of the turret tiles. Background details for making the tiles supplied by Stuart Matthews — Northern Roof Tile. Pine l” x 2″ over the entire roof surface spaced accordingly. 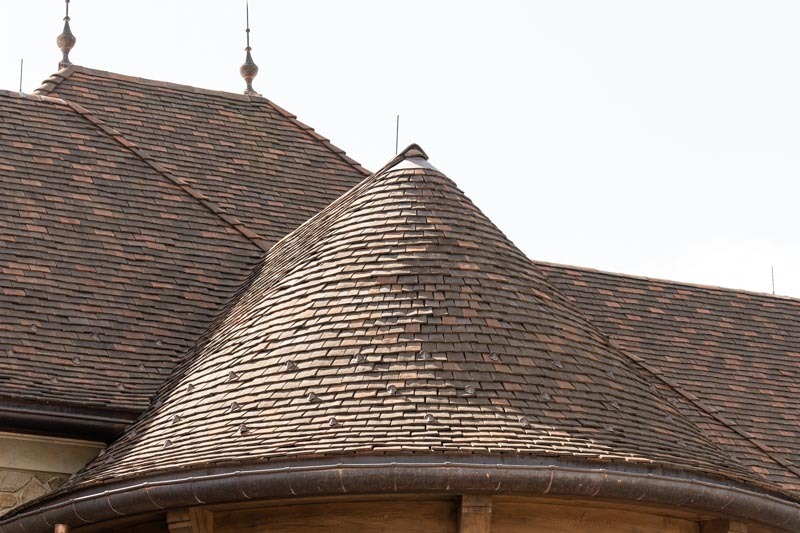 Hogs back ridge tile (12″ laid abutting). Tapered overlapping hips laid with 8-1/2″ exp. Valley tile to suit 12 / 14 50 degree roof pitch (one per course). Valley tile to suite swoop 9 courses (one per course). Eave course tiles and eaves to flat roof. Top course tile and head abut to flat roof. Garage and side entry overhangs Rear veranda roof. Supply and install 6″ 1/4 round 20 oz. 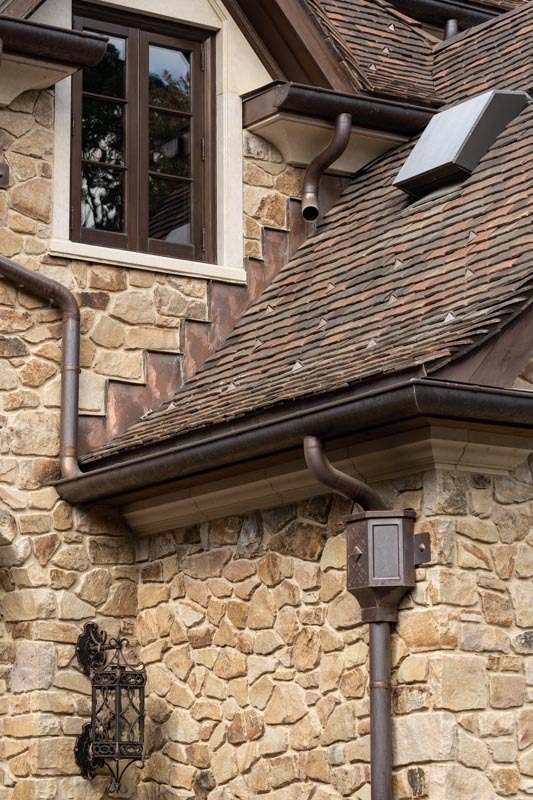 cold-rolled copper Gutters with soldered joints, complete with end pieces, and outlet tubes. Custom-fabricate and install door pans, fully soldered and top door flashing at thirty-one (31) locations. Custom-fabricate and install window pans, fully soldered and top window flashing at fifty-six (56) locations. Custom-fabricate and install at all garage doors, fully soldered. 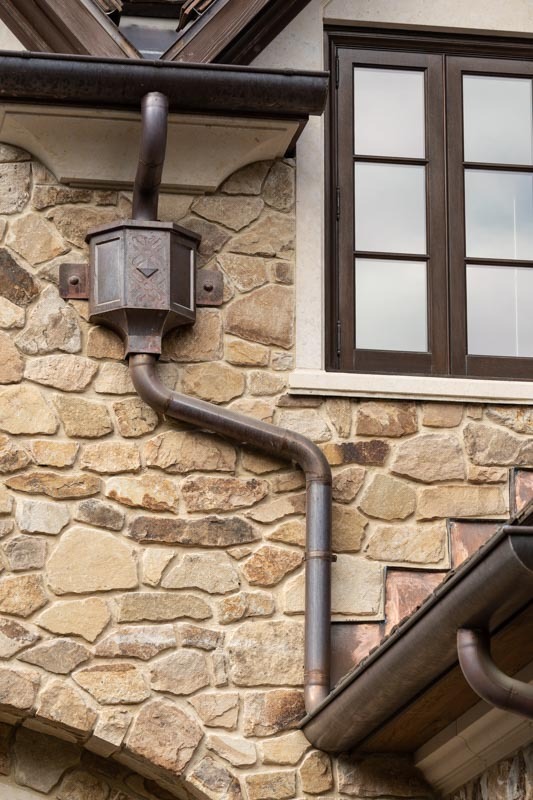 Fabricate and install cold-rolled copper gutter and downspout, finials and conductor head.